Nina Dobrev arrives at the 63rd Annual Primetime Emmy Awards held at Nokia Theatre in Los Angeles on September 18, 2011. She wore a super elegant strapless red formal dress. The long red evening/ pageant/ prom gown is simply stunning in every detail! 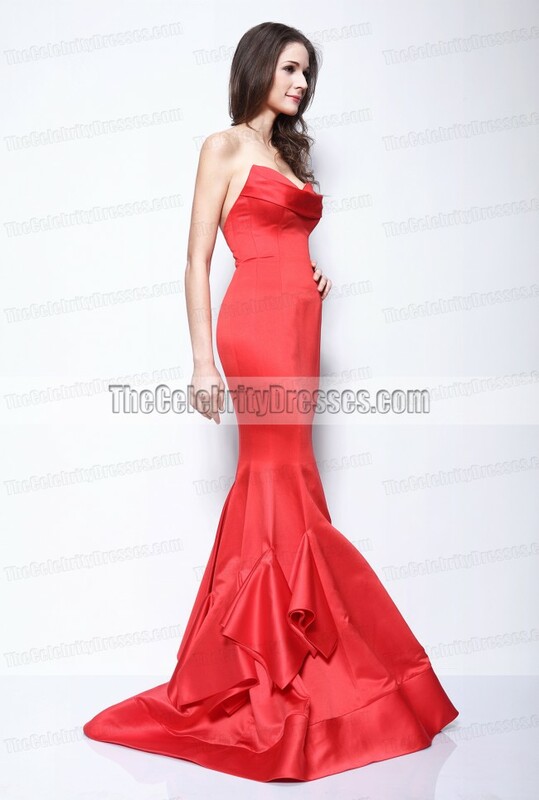 This classy red evening gown will make you the center of attention at any formal events! A: Dear Catherine, We just sent the pictures to your email. Please check them. Thank you for your interest. A: Dear, Yes we can do that. Please include your request in your order comment. You will be able to leave a comment at the last step checking out before making payment. Thank you for contacting us. Q: Do you have pictures of your recreation of this dress? A: Hello Monet, We just sent the pictures to your email. Please check them. Thank you for contacting us! Q: can you please send me a photo of the ACTUAL dress ready to send. Red Uk size 6 please thank you. A: Dear jenny, We just sent the pictures to your email. Please check them. Thank you for contacting us! A: Dear Emily, We just sent the pictures to your email. Please check them. Thank you for contacting us! Q: Can you psot a picture of a real customer dress? A: Dear Helena, Sorry we don't have the pictures of our customers now.Please check the pictures of our model in this dress.Thank you for contacting us! Q: Do you have a picture of the Actual Dress, like the one you guys have? A: Dear, Yes we just sent the pictures to your email.Please check them.Thank you for contacting us! Q: Hi, even though you don't have pictures available of the dress in yellow and champagne, is there any way you could send me pictures of similarly coloured items on your site? Or even the similar colours from the colour chart? Just so I can get an idea of the shade of yellow, and the shade of champagne it would come in. Thanks! A: Dear Vanessa, Yes we just sent the color chart to your email.Please check it and add the request of color # in your order comment at the last step of checkout.Thank you for contacting us! Q: Hi, I was wondering if you could send me pictures of this dress in champagne and yellow? Thanks! A: Dear Vanessa, Sorry we don't have the pictures of the dress in champagne and yellow color now.Sorry for your inconvenience.Thank you for your interest. Q: Is it possible to mak when this in an emerald green colour? Absolutely in love with this dress! A: Dear Madison, We just sent the color chart to your email.Please check it and add the request of color # in your order comment at the last step of checkout.Thank you for contacting us! I understand that I live in Guam and it was busy season so my dress arrived in 6 weeks, however they do quote you 4-6 weeks in their statement so that was fine with me. The dress itself is made very well and the train is very heavy. I thought the darts(the extra pieces along the bottom) would be higher, there is one in the back that is much higher than the rest. I understand I'm not there so they can't make the dress to fit my body exactly, so I will have to take it to the tailor to refit the bust(it just needs to be tighter) as well as tightening the seems along my thighs so it makes a true mermaid form. Even with my shoes it is a little too long, however that may have been my own measuring. Other than that which does seem like a lot of issues based on the price, I am very happy with the quality of the dress, and those are really minor tailoring issues. Like I said before if I was there to be fitted face to face they wouldn't even be necessary. Once my alterations are finished I will be more than happy to post pictures. @Chelsea can you post pictures? My daughter ordered this dress for her senior prom. We had it custom made as she is only 5 ft tall and regular sizes are too long. We measured her as the order requested, and when the dress arrived, it was a perfect fit. We added 4 in. on to the length to accommodate her heels and even the length is perfect. As others have said, the train is heavy and she had to hold it in her arms when walking around, but the train looked amazing in pictures, and it is exactly the look my daughter was going for...she did not want a cookie cutter prom dress that everyone else had, and she really looked amazing. I would recommend using this website for that special dress you just can't find in the stores, just make sure your measurements are accurate because a custom dress cannot be returned. Good luck!! I absolutely love this dress! My prom is March 29th which is two days away, so I was in such a rush to find the perfect dress. I had been looking for over a month and hadn't found anything that I was just drawn to or that would ship in time. I finally just typed in celebrity dresses, and I was led to this site. I looked for "in stock" dresses because I needed something to come super fast. To make sure that my dress would come in time, I utilized the live chat system, and asked them when could I receive my in stock dress. They were the best! I told the lady that my prom was near and that I needed it by march 25 to get all of my accessories and things. She told me to give her my order number when I ordered the dress so she could make sure it got here, and to make sure that I wrote a comment telling them when I needed it. I tell you, my dress came on march 25 (5 days after I placed the order!)! I didn't actually receive it in my hands until march 26 because I missed the delivery guy. All in all, they were true to their word. When I tried on the dress, I must admit I was pretty nervous. I ordered a size 4 with no alterations,but I have a big caboose and hips so it was way too snug for my liking in those areas. Everywhere else it was a great fit. In this dress, i suggest getting a size up so that you can have some wiggle room because the material the dress is made of has very little to no stretch. People have said this in comments above, and i didn't believe them because i wanted my dress to be form fitting, but if you have a shape like mine, then you seriously need to get a size bigger or two because dancing at prom will be a beast! It's hard to even side step how tight this dress is! I suggest if this is the case for you, wear the dress around to see if it will loosen the material a little. The length is great. I'm about five ft two on a good day, and the dress was fine with the accommodation of my four inch heels. As far as the shininess that everyone has mentioned, sure its not as matte as the lady in the picture, but it wasn't too shiny for me. In fact, i think it fit the occasion better with that material they used. Also the train was really long (maybe two ft and a half!) but omg it was beautiful (great effect for when taking pictures especially when it's fully flared out). I was just worried about people stepping on it or it just dragging and getting dirty. I will admit, I started stressing out and wanted to immediately send the dress back. I emailed them that night at like ten, and they emailed me that morning at like seven saying " we're sorry it didn't fit well" " maybe you can get it tailored". They even offered my a discount for the inconvenience or something to that avail. I could really tell they were trying to work with me. I talked to my mom about it and showed her the dress on. She thought it was gorgeous, which I did too, but minus the fit issue and the train. She told me that she had a friend that could tailor it for me, and while getting it fixed the lady flipped my train over and attached a button or something, so that I could flip my train up to dance or walk and let it back down when I wanted to. Trust me it wasn't tacky at all! In fact, when the train went up I liked it even better because it just added more uniqueness to the bottom of the dress. This is just a suggestion for the train issue you'll face if you don't want to pay or wait for a custom dress to ship that will alter the train. To be honest, don't get rid of the train! Just lift it up like I did because the train is seriously a red carpet, show stopper! This dress was everything! I'm just apprehensive anyway. It's in my nature to be worried and wishy washy. there was never anything wrong with the dress that couldn't be fixed in like a day with little alteration or pay. The dress is crafted beautifully(you all should see the inside lining)! Even though people said the dress was shiny, it's not cheap shiny. It's quality material! They nailed every detail on the original especially the rouching on the bottom! I was highly impressed with their service, their shipping most definitely, and the quality that I received. This dress and service were well worth the 218 that I paid plus shipping price. This is seriously now my go-to formal dress site. If you read through all of this, you're a trooper. I hope this helps, feel free to ask anymore questions, I would love to answer! If I can, I will post pictures of me in the dress on prom night. I'm so team thecelebritydresses.com! @Jazzmyn can you psot pictures please? I love this dress! I ordered it.. and it came after 4 weeks! The material is a bit shinier .. (looks a bit like silk) and to be honest it looks better I think.. Looks great around the bust and thigh area. The only thing is the train is a bit longer than I though and the fit is not what I expected. I am a US size 8. so I ordered 10. This size fits me exactly and I think I might even take it out an inch so I can breath. I will also probably shorten the train. I SUGGEST YOU ORDER TWO SIZES UP! And the boning is only in the bust area.. not stomach area... but nonetheless a great buy! I just received my dress yesterday it's beautiful,but I agree with the others the fabric is shiny almost like satin matieral,but fits great and train is slightly heavy. Otherwise it's gorgeous. The dress is very nice, but I must also has it is shinier in person then in the photo. The fit is very nice I am size 4 and got a 4 fits like a glove. The dress came much quicker than I expected too thought it would've been longer but surprisingly came sooner than expected !